Six teens come out as transgender. They speak of problems–social and familial–and the pleasure in being who they are. Photographs show changes. The modern civil rights movement has expanded to fight for the rights of people with different sexual preferences and identities; Beyond Magenta addresses the transgender part of the movement. The book presents six stories—told through annotated transcripts of interviews—of courageous and articulate transgender teenagers. Through these intriguing stories, the book provides interesting details about and insights into the experiences of teenagers with gender-identity issues. 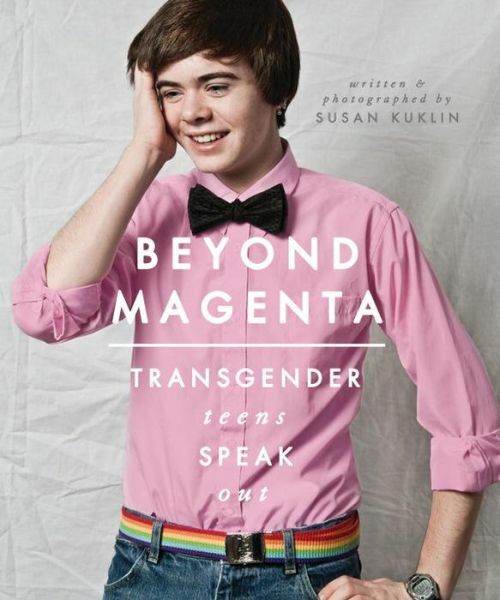 Rather than relying on clinical language, Kuklin uses transgenders’ own thoughts and feelings to define transgender and to explore the problems they face—such as being trapped in an alien body, being rejected by family and friends, and enduring extensive physical and psychological bullying—and their solutions.